Jeff, a reader of the blog, asks for comment on this blog post of his (link). The highlight of the post is this chart, which shows an uneven distribution. The message of the chart is that a large amount of donations (about 25%) came from the top 3 percent of donors. This is a long-tailed distribution, and quite typical of much data that have to do with financial matters. Thus, it is a general problem as many of us encounter this type of data. One of the insights from Jeff's post is that with some tricks, one can generate a chart that looks like the above using Excel. This is pretty impressive, and he credits Peltier for the pointer. Now, let's see if there are other ways to present this data. One issue I have with the chart is that the most important statistics are found in the text labels. These are of the form: "X% of customers contribute Y% of revenues". So, in effect, there are two relevant data series, one of the share of people and then the share of revenues. Here, the information is primarily encoded in the dotted guide lines between the two columns. It has the advantage of showing both the absolute share of people as well as of revenues, plus showing the uneven distribution between the two data series. But it is also less fun to look at. The advantage of the original chart is that one can imagine that all the donors are being lined up along the horizontal axis from those who gave the least to those who gave the most. That's a pretty powerful mental picture. The weakness of the original is that few of us can mentally tally up the strangely shaped areas to learn the share of revenues. I like this one because it places the two data series on equal footing, and allows for efficient comparison of the two sets of proportions. It also has the feature of showing all the shares, just like the stacked columns. The vertical axis is labelled "subscription value" instead of "How much do we get for each subscription". This is a slight improvement, using fewer words to convey the same point. The breakpoints have been set differently to split the revenues into five so that each segment now accounts for exactly 20% of the revenues. I actually prefer the original segmentation -- that one visually picks out the breakpoints in the data, thus it is empirical rather than canonical. Look at the split between the gray and the yellow segments in the new chart. Does it make sense to split customers with the same subscription value into two groups? Where are the millionaires? Where's the news? Welcome to North Dakota, which jumped 14 spots in the annual rankings of millionaire households per capita released by Phoenix Marketing International. The trouble is, you can't pick North Dakota out of the map; it just doesn't stand out. The map uses a different methodology of ordering the states, by groupings of the prevalence of millionaires, that is, the proportion of households in each state who are labeled "millionaires" by Phoenix Marketing. The text, by contrast, draws attention to the change in the rank of states using the proportion of households who are millionaires as the ranking criterion. 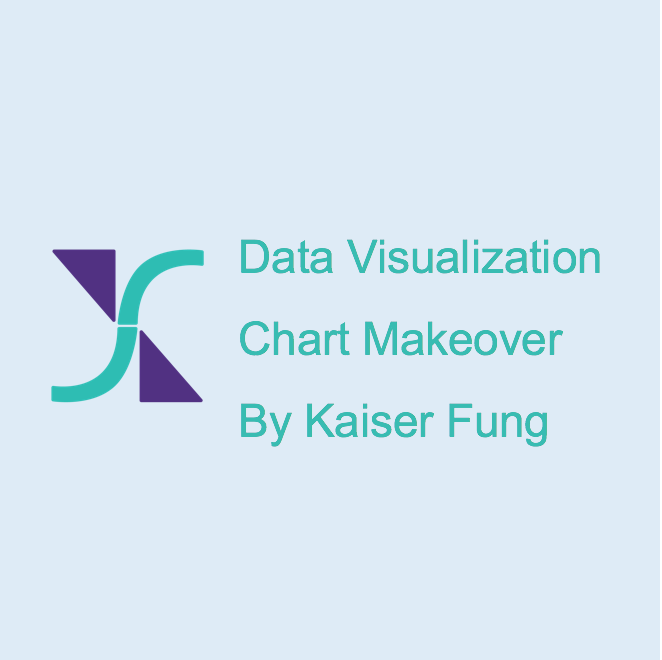 This data is two steps removed from the data used for the map (start with the map data, compute the year-to-year change, then convert to ranks). I labeled the North Dakota data point to show how unremarkable it is. While it may have risen in "rank", it is still ranked below median in terms of number of millionaires per 1000 households. Also notice that of states with similar number of households, the millionaires metric ranges wildly from 40 to 70 per 1000 households. An interpretation of these state average millionaire metrics has to account for state population size. Think of an accounting equation. In this view, the positive changes must balance out the negative changes since I am only converned about any shift in mix. What this map shows is that Texas, California, New York, and Washington have the top net gains in the number of millionaires while Florida, and Michigan have the biggest net losses. North Dakota is again in the middle of the bunch. This view ignores the total net change in millionaires as it focuses on the mix by state. You'd need to figure out what is the relevant question before you can come up with a good visualization of this (or any) data. I'm very excited to preview the syllabus of a new dataviz course I've been developing to be launched in Spring 2014. This course is focused on the craft of graph building, and is modeled after the writing workshop. Students will work through multiple drafts of a project while giving and receiving criticism from other students. To my knowledge, this is a one-of-a-kind course so I'm putting up the syllabus and will report on how it goes over in a few months. I hope the format will prove successful and others will offer graph building workshops in the years to come. I'm open to suggestions about the syllabus. The course is offered as part of the brand-new Certificate in Analytics and Data Visualization at New York University. The announcement of the Certificate is here. You can sign up for the course here. Please spread the word! Data visualization is storytelling in a graphical medium. The format of this course is inspired by the workshops used extensively to train budding writers, in which you gain knowledge by doing and redoing, by offering and receiving critique, and above all, by learning from each another. Present your project while other students offer critique and suggestions for improvement. The course offers immersion into the creative process, the discipline of sketching and revising, and the practical use of tools. You will develop a discriminating eye for good visualizations. Readings on aspects of the craft are assigned throughout the term. For students in the Certificate of Analytics and Data Visualization, the course offers a chance to demonstrate mastery of the integrated approach combining the perspectives of statistical graphics, graphical design, and information visualization. This is not a beginner’s class. You should have prior experience making data graphics for an audience, and feel comfortable offering critique of other’s work. For students in the Certificate of Analytics and Data Visualization, appropriate preparation includes these courses: Introduction to Analytics and Data Visualization, Statistical Foundations of Analytics and Data Visualization, Applied Data Management for Analytics and Data Visualization, and Designing Data: Infographics. Because of these prerequisites, you may execute designs in your preferred set of tools, such as Excel, Adobe Illustrator, R, Processing, Tableau, and JMP. Kosara, Robert. "Visualization criticism-the missing link between information visualization and art." In Information Visualization, 2007. IV'07. 11th International Conference, pp. 631-636. Kosara, Robert, “A Criticism of Visualization Criticism Criticism”, blog post, July 2012. http://eagereyes.rog/criticism/criticism-visualization-criticism-criticism. The above three references form a dialogue. Gelman, Andrew, and Antony Unwin, “Infovis and Statistical Graphics: Different Goals, Different Looks”, Journal of Computational and Graphical Statistics 22(1): pp.2-28. Gelman, Andrew, and Antony Unwin, “Tradeoffs in Information Graphics”, Journal of Computational and Graphical Statistics 22(1), 2013: pp. 45-49. This is a rejoinder to the discussion of the previous article. Mitchell, Ian. "AUThoRiTy oR CLiChé? the graphic language of information Design." research, education and design experiences (2012). Rhyne, Theresa-Marie, “Does the Difference Between Information and Scientific Visualization Really Matter?” IEEE Computer Graphics and Applications 23(3): 6-8. North, Chris, “Toward Measuring Visualization Insight”, IEEE Computer Graphics and Applications, May/June 2006, pp. 6-9. Heer, Jeffrey, et. al., “A Tour Through the Visualization Zoo”, Communications of the ACM 53(6): June 2010, pp. 59-67. Van Wijk, Jarke J., “Views on Visualization”, IEEE Transactions on Visualization and Computer Graphics 12(4): July/August 2006, pp. 421-432. How should visualization be measured? What works fall under the data visualization label? What can graphics designers learn from Norman's approach to product design? During the course, each student will hand in two drafts of a graphic, the second of which should take into account prior criticism. The class will be divided into two groups, and projects will be workshopped in alternate weeks. It is crucial that projects are submitted on time so that your classmates have time to prepare considered criticism.